Key Republican members of the House Judiciary Committee are pressuring Chairman Bob Goodlatte (R., Va.) to investigate former senior Obama administration officials believed to be responsible for these anti-Trump leaks, including former United Nations Ambassador Samantha Power, National Security Adviser Susan Rice, and National Security Council official Ben Rhodes, according to sources who spoke to the Washington Free Beacon about mounting frustration over Congress's failure to adequately investigate these leaks. The House Intelligence Committee is engaged in a separate but related probe into efforts by Obama officials to "unmask," or formally identify individuals named in classified intelligence community reports related to Trump and his presidential transition team. That investigation is currently focussed on Power, Rice, and former CIA Director John Brennan. Sources in the Trump administration and Congress believe the classified intelligence information was "weaponized" and later leaked to the press in order to handicap the Trump administration's credibility and national security priorities. Congress is "not going to reauthorize a program if no one is held accountable for breaking the law," said one senior congressional source familiar with the situation. "No one is being held accountable and Congress has done no oversight." Goodlatte is said to have initially been "really taken aback" by the stiff opposition to reauthorizing section 702, but is now making moves to examine the former administration's role in classified leaks and potential opportunities to question these officials. 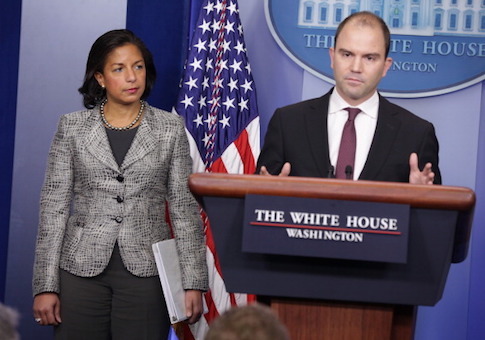 Republican members on the committee are said to be "all united" in their desire to investigate former Obama officials such as Rhodes, Rice, and Power, sources said. These lawmakers "want answers on these Obama officials in order to continue [spy] authorizations they may have abused," one congressional source said. "The members in the conference and these committees have reached a boiling point." Rep. Ron DeSantis (R., Fla.), chair of the House Subcommittee on National Security, which deals with these issues, told the Free Beacon earlier this month that Rhodes and others must be held accountable for any role they might have had in the leaking of classified information. "I think Congress and some members on the Intelligence Committee can call Ben Rhodes to testify," DeSantis said at the time. "He may be able to invoke executive privilege from when Obama was president, but he definitely can't do that in any interactions he's had since then." DeSantis further identified Rhodes and other senior Obama administration officials as being "involved with feeding journalists some of these [leaks]. I believe he's in touch with people on the National Security Council. It would be absolutely legitimate as part of leak investigation to bring him in and put him under oath, and I would absolutely support doing that." The Free Beacon first disclosed last week that Power, a key Obama confidante, was emerging as central to the investigation into efforts by Obama administration officials to identify individuals named in classified intelligence community reports related to Trump and his presidential transition team. Power's role in this unmasking effort is believed to be particularly questionable given her position as the U.N. ambassador, a post that does not typically require such sensitive unmasking activities, according to former U.S. officials and other sources. "Unmasking is not a regular occurrence—absolutely not a weekly habit. It is rare, even at the National Security Council, and ought to be rarer still for a U.N. ambassador," one former senior U.S. official told the Free Beacon.